A Bloody Mary from Scala’s Bistro. Photo courtesy Scala’s website. 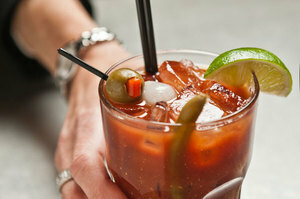 Lots of Bloody Mary news from ~SCALA’S BISTRO~ this week! On Sunday August 26th, they will host the Sunday, Bloody Sunday Battle, in which ten contestants will compete for the title of “Best Bloody Mary.” Last year’s winner, Jason “Buffalo” LoGrasso, will be on hand to judge. Contestants this year include Kate Bolton from Maven, Shaher Misif from Cantina, Claire Sprouse from Rickhouse, and Vincent Toscano from Rye. Tickets are $25, and proceeds will benefit CUESA. The Scala’s brunch menu will be available during the event. Sunday August 26th, 12pm-3pm. Additionally, the contest launches Scala’s new Bloody Marys of the World menu, which features Bloodies with flavors from all over the globe. Options include the Mary of Mumbai, with Bombay Sapphire, paprika, yellow curry, cardamom, coriander, and spiced verjus; and the Pisco de Gallo, with Encanto Pisco, heirloom tomatoes, garlic, cilantro, lime, and red onion. This international Bloody Mary menu will be available on Saturdays and Sundays, in addition to the regular drink and food menus. With San Francisco summer (i.e., September) approaching, bet you wish you could take tasty, seasonal beer to that party at the neighbors’. You’re in luck. As of August 31st, Almanac Beer Co. will have two new, year-round beer offerings, in addition to their limited-release seasonal brews. The Extra Pale Ale features California barley and Mandarin oranges from Blossom Bluff Orchards and is absolutely delicious (we got a taste this weekend at the SF Street Food Festival and j’adored it). The Honey Saison is brewed with the same hops, Marshall’s Farm honey, and local ginger for spice—it’s excellent on a warm summer day with spicy food (again, ask us how we know this). The new beers will be sold in four-packs of 12-ounce bottles at places like BevMo and Whole Foods. To celebrate the new selections, and their one-year anniversary, Almanac is throwing a party at Bloodhound (music alert!) on Wednesday August 29th from 6pm-9pm. There will be beer specials and free nibbles from Deli Board and 1058 Hoagie—hubba hubba. Bloodhound, 1145 Folsom St. at 7th St. 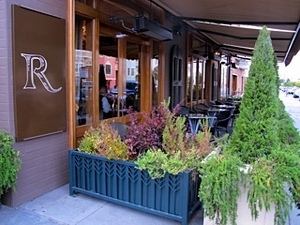 The outdoor patio at Ristobar. Photo: © tablehopper.com. A few deals for your liquid consumption radar: first, ~ONE MARKET~ is offering $2 martinis during lunch on weekdays. All you have to do is buy a lunch entrée. Limit two per person (no three-martini lunch for you, babe). ~RISTOBAR~ in the Marina has launched a new brunch menu, with $4 mimosas and Bellinis (brunch is Sat-Sun 11am-3pm). And FiDi workers should know that the ~ROYAL EXCHANGE~ is celebrating its 40th anniversary next week (August 27th-31st). Guests will be able to eat and drink at 1972 prices: $2 Bud or Bass Ale on draft, $4 martinis or Manhattans, along with $4 roast beef or turkey sandwiches, and $3 hot dogs. And on Friday August 31st, you can order $2 well drinks and beer specials (8pm-10pm). Go crazy. And good news for ~THE ICE CREAM BAR~ in Cole Valley: they finally got their beer and wine license. 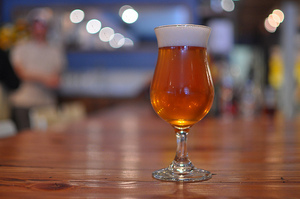 Check out the menu here—the “adult” beverages will be available as of Friday, like the Peaches and Dreams (Lagunitas Little Sumpin’ Sumpin’ Ale, peach syrup, five-spice tincture, cream, acid phosphate). FYI, since this is a preliminary menu, the fountain drinks on the “remedies” menu will be in the $9-$14 range. There will also be sherries and ports.